Capital Colnardo is a seasoned international competitor who has garnered top results across Europe and North America. He is considered to be one of best showjumpers in the world today. Capital Colnardo started his show career with Nicole Horwood in South Africa before moving up the ranks from CSI2* to CSI5* with Audrey Coulter and Harrie Smolders. He has delivered many clear rounds and top placings in various Nation’s Cups, Global Champions League, and countless international Grand Prixes including winning at the Longines Masters of New York and CSI 5* Basel in 2018. In 2018, Jennifer Gates of Evergate Stables, LLC purchased Capital Colnardo and has been campaigning him successfully in the US and Europe. Capital Colnardo’s pedigree showcases the very best Holsteiner blood, including the influential Carthago, Lord, and Corrado I. Colman, Capital Colnardo’s sire, won his 100-day jumping test and was placed in the top group overall. Colman has become one of the leading German sires due to his offspring’s success in the show ring and his high rate of producing exceptional licensed stallions. Capital has great intelligence and rideability, looks, and a lovely temperament. He has easy scope for the jump and an effortless ground covering stride. His small crop of offspring are showing athleticism and scope. Pacific des Essarts is a consistent and experienced international competitor. He was imported to the U.S. by Evergate Stables, LLC in 2017 and is actively achieving clean rounds and top placings with Jennifer Gates. They were 3rd in both the Hermes U25 team event and 3rd SJHOF High AO Classic this year, and were 3rd $25K GP Del Mar and 2nd Del Mar J/AO Jumper Challenge in 2017. Previously he jumped to several Grand Prix wins with Martin Fuchs and Anna-Julia Kontio including 1st CSI5* 2016 Paris-Grand Palais; 1st CSI5* W 2016 Zurich, 1st CSI3* 2016 Selva di Val Gardena, 2nd CSI5* 2016 Hong Kong, 2nd CSI4* 2016 Ascona, 1st CSI3* 2015 Ascona, 2nd CSI3* 2015 Humlikon, and 3rd CSI5* W 2015 Madrid. Pacific des Essarts is by the famous stallion, Diamant de Semilly, the number one leading WBFSH sire for the past several years. Diamant is currently sire to the #3 show jumper in the world, Don VHP Z (Harrie Smolders) as well as Smolder's other top mount, Emerald, and countless other CSIO5* winners including Quickly de Kreisker, Muscaris d'Ariel, Deauvelle S, Quointreau un Prince, Street of Diamonds, and Elivs ter Putte. He has sired over 100 approved stallions and is even listed in the top 20 of the eventing sires on the WBFSH. Pacific des Essarts dam, Cybele des Essarts, produced another successful 1.60m offspring, Kanouk des Essarts, with rider Jill Smits. Pacific des Essarts has had very limited offspring, but they are all showing tremendous talent including 6yo SF gelding, Bracadabra, competing at ISJ Level 1.35m with Romain Ozzola (FRA) and Laurent Guillet (FRA) and during 2017 was 1st in the CSIYH1* 2017 Chazey sur Ain and 1st in the CSIYH1* 2017 Oliva-Valencia. Another offspring, 7yo SF gelding, Allblack de Gressoux, is already successfully jumping ISJ Level 1.40m with Paul Delforge (FRA). The Paris Panthers are thrilled to announce our 2019 Global Champions League lineup! In addition to an amazing group of riders, Rob Hoekstra has been appointed team manager for the 2019 season. Thank you to our team sponsors, Edmiston Yachts, NetJets, Evergate Stables and Maui Jim for your continued support! To read more about about the 2019 Global Champions League season and view the event schedule, click here. GC Super Cup Finale. Photo by Ashley Neuhof Photography. Yuri Mansur and Ibelle Ask. Photo by Ashley Neuhof Photography. Gregory Wathelet and Mjt Nevados S. Photo by Ashley Neuhof Photography. Darragh Kenny and Balou de Reventon. Photo by Ashley Neuhof Photography. After three thrilling rounds of competition, the Paris Panthers finished third in the extraordinary GC Super Cup Finale on Sunday, December 16 at the 02 Arena in Prague. Team combinations Darragh Kenny (IRL) and Balou de Reventon, Yuri Mansur (BRA) and Ibelle Ask, and Gregory Wathelet (BEL) and Mjt Nevados S gave it their all throughout the weekend, finishing first in the Quarter Finals and third in the Semi-Finals before Sunday’s finale. Read the full recap of the GC Super Cup Finale here. Jennifer Gates and Evergate Stables are proud to announce the addition of Harrie Smolders’ Capital Colnardo to our team of equine athletes. Previously competed by Audrey Coulter, the 13-year-old stallion has had an amazing year with Smolders, competing in the Hickstead Nations Cup and winning in New York and Basel, with multiple placings at other international events. Jenn made her debut with Capital Colnardo at the Lier International Horse Show last month, and looks forward to the development of this new partnership. Jennifer Gates and Monaco in the Longines FEI Jumping World Cup™ Las Vegas. The Evergate Stables team had a successful weekend of competition at the Las Vegas National Horse Show CSI4*-W, earning multiple top ten placings in the FEI classes. The team started off strong on Saturday, with Nayel Nassar and Lucifer V earning the top spot in the $50,000 FEI 1.45m Las Vegas National Winning Round Jumper Classic, presented by Park Place Foundation. The last to go of ten combinations in the jump-off, Nayel and Lucifer finished only half a second ahead of second place finisher, Kristen Vanderveen, for an exciting victory. Jennifer Gates and Alex also went clear to return for the jump off, finishing eighth overall after incurring four faults over Anthony D’Ambrosio’s technical jump-off course. Later in the evening, Jenn and Monaco were first in the ring for the $135,000 Longines FEI Jumping World Cup™ Las Vegas presented by Walter Oil and Gas Corp., the final opportunity this year to earn points for the Longines FEI Jumping World Cup™ in Gothenburg, Sweden in 2019. Riding without fault in the first round, Jenn and Monaco were one of only six clear rounds that returned for the jump-off. With one fence down on the fast-paced and winding shortened track, the pair finished sixth overall. In his second victory of the day, Nayel rode double clear aboard his longtime partner, Lordan, to take home the blue ribbon in this Longines FEI Jumping World Cup™ qualifying event, besting a field of thirty competitors from six countries who were vying for North American League points. Coming off a win at least week’s qualifier in Thermal, CA, Nayel and Lordan will be ones to watch for the remainder of the 2018-2019 season. Watch the $50,000 FEI 1.45m Las Vegas National Winning Round Jumper Classic on the FEI Youtube channel here. Watch the $135,000 Longines FEI Jumping World Cup™ Las Vegas on FEI TV here. Nayel Nassar and Lucifer V.
Las Vegas, NV [Edited Press Release]– In a class of thirty-four entries, Nayel Nassar and the 12-year-old gelding Lucifer V galloped into the winner’s circle in the $50,000 FEI 1.45m Las Vegas National Winning Round Jumper Classic, presented by Park Place Foundation. Anthony D’Ambrosio’s challenging 1.45m first round course featured tight turns, direct bending lines, and two double combinations. Under FEI Rules, the best ten athletes (at least 25% and all clear rounds) qualify for the Winning Round. In this class, eleven clear rounds returned with a clean slate, in reverse order of their time in round one. The second-round course included all the ingredients for a nail-biting finish – long gallops, big oxers, and options for tight inside turns. Nearly all of the returning riders posted clean rounds. Kristen Vanderveen, the second rider to return, posted a very impressive time of 45.91 seconds, leaving out strides in the bending lines and keeping a gallop throughout the entire course. Las Vegas – Nov. 18 – The Las Vegas National Horse Show might take place in the entertainment capital of the world, but it’s business as usual for those on the ground at the South Point Hotel Casino and Spa’s South Point Equestrian Center. Get the inside scoop on some of the faces we saw on site. The Evergate Stables team is deeply saddened to report the passing of Cadence, a 17-year-old warmblood gelding and part of our family for the past five years, on October 1, 2018. Always stoic, Cadence showed no symptoms of discomfort prior to the day he was admitted to the San Luis Rey Equine Hospital on September 29th. It was quickly discovered that Cadence had developed an irreparable perforation in his esophagus due to an abnormal muscle segment, a condition that rarely offers any warning signs. Ridden by Jenn Gates, Cadence was well known for his success as a junior jumper and later in World Cup Qualifiers. He also loved trail rides, and was known for his sassy personality. Our heartfelt thanks goes out to Dr. Korin Portenza and the team of people that cared for Cadence at San Luis Rey Equine Hospital during his final days, as well as Dr. Melissa Welker and those who knew and cared for him throughout his lifetime. CNN's Anna Stewart takes us through Monaco, Paris & Chantilly for the July events of the Global Champions Tour and Global Champions League. Jennifer Gates and Luftikus at the Longines FEI Jumping Nations Cup™ Coapexpan. Photo by Ashley Neuhof. Jennifer Gates, owner of Evergate Stables and one of the United States’ top up-and-coming U25 riders, is proud to announce a new training partnership with Harrie Smolders (NED), currently ranked #1 in the world on the Longines Rankings. Gates, who graduated from Stanford University this June, will focus full-time on her riding before entering medical school. Her plans for the coming year include competing in several Grand Prixes on the Global Champions Tour and other high-level show jumping competitions. Gates is excited to elevate her competition through this new partnership with Smolders. Jennifer Gates and Evergate Stables LLC's Cadence were awarded the blue ribbon in the JR/AO Jumper Challenge. Sayre Happy finished seventh on Celena VDL and eighth on New York in the Surfside Grand Prix presented by the Competitive Equestrian. Sayre and New York also finished ninth in the $100,000 Grand Prix of Del Mar. 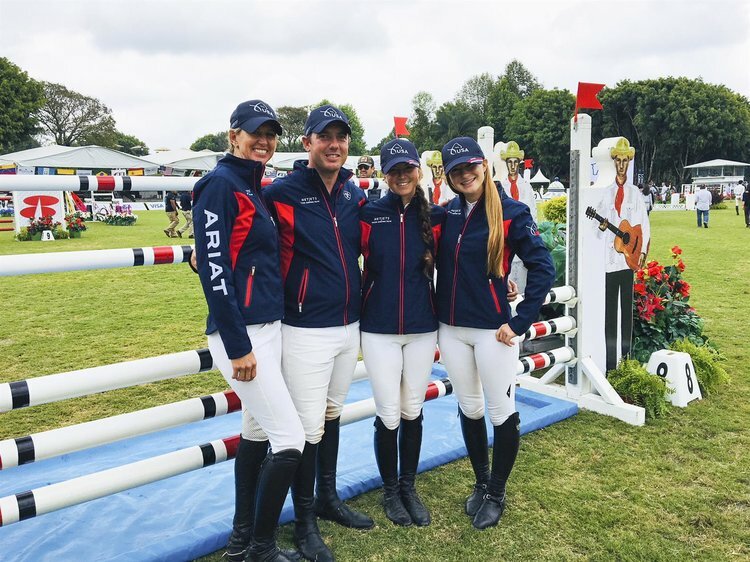 The NetJets® U.S. Show Jumping Team of Alex Granato and Carlchen W, Kelly Soleau-Millar and Cacharel, Jennifer Gates and Pumped Up Kicks, and Ali Wolff and Casall, finished with 17 faults to win the silver medal in the Longines FEI Jumping Nations Cup™ Mexico on Sunday, April 22. Jenn Gates (Medina, Wash.) and Pumped Up Kicks, Evergate Stables LLC’s 14-year-old Warmblood gelding, have been named to the NetJets® U.S. Show Jumping Team for the FEI Jumping Nations Cup™ Mexico on Sunday, April 22, 2018. McLain Ward has won three CSI 5* $132,000 Equinimity WEF Challenge Cups at the 2018 Winter Equestrian Festival in Wellington, FL. Jenn Gates recently spoke with the Horse Network about her Levistos and how much she appreciates working with these exceptional horses. Given to an up-and-coming young rider, The United States Equestrian Team (USET) Foundation selects an athlete who embodies the spirit of horsemanship and equestrian sports excellence. Jenn Gates had big wins in Lexington, including taking home the $100,000 USEF U25 Show Jumping National Championship with her horse Alex. Jenn Gates takes on the City That Never Sleeps and wins in tough competition. Jimmy Torano of Wellington, FL, secured his second grand prix win of the Vermont Summer Festival in the $30,000 Manchester & the Mountains Grand Prix. The Paris Panthers placed 2nd in the prestigious Global Champions League show jumping competition at Cascais, Portugal. The Paris Panthers win the top prize in Shanghai after a thrilling third round of action on the Global Champions Tour. Jenn Gates is making her mark on the global show jumping circuit, showing off Bardolino, a horse who made his debut at the Rio Games. Horse lovers from all over the world gathered in Omaha to watch the world's best equestrians compete for the Grand Prix. In a field of talented jumpers, Jenn Gates (USA) placed second with a time of 33.21 seconds aboard Evergate Stable’s Pumped Up Kicks. This is her second big win at the renowned 2017 Winter Equestrian Festival (WEF) in Wellington, FL. Jennifer Gates and Pumped Up Kicks. Jenn Gates took third place in the prestigious 2017 Winter Equestrian Festival at the Palm Beach International Equestrian Center this weekend while Todd Minikus and Babalou 41 took the top prize. Jenn Gates talks about her horse Pumped Up Kicks, balancing competing, and being a full-time student. A challenging course produces great results. Talent and hard work have helped Jenn Gates rise to the top of her class.